It seems like an absolute age since I have sat here, perched purposefully on my old wooden chair, so old and well used the padding has worn rather thin and, if I look too closely, rather grubby too. Back in days when it was the done thing to give babies morphine for toothache and people hung arsenic infused wallpaper to make their walls look pretty, a house doctor in his black frock coat would probably have put my malaise down to nerves, which in Victorian times seemed to cover a vast plethora of maladies. Without boring you all stiff, someone locally to me shot my beautiful Bengal cat with an air rifle and after the poor animal had suffered a very traumatic and painful few days, we had no other option but to put him out of his misery. To put it mildly, the whole affair was extremely upsetting and the domino effect it had on me and my family was obviously something that the perpetrator did not consider when he pulled the trigger. Well, I choose to think not. Anyway, my sensitive soul is now on the mend and here I am trying to catch up with the blog, Twitter, Face Book et al as well as the gardening, washing, ironing and all the other household chores I have let slip over the past month or so. Cooking has unfortunately been relegated to a backstage role. I am feeing rather guilty that the cake tin has been glaringly empty for the past few weeks and the troops have been getting by with ice cream, the odd digestive and occasional jam laden crumpet to appease their sweet cravings. I must say that they have been very patient and not once have I heard any rumblings of discontent or hints at mutiny in the kitchen. I made this plum cake last week for a lovely friend of mine who has been very supportive in the most positive way. She encouraged me to get out of the house by asking me to walk her beautiful young dog. A simple task but an activity that always makes me feel at peace with the world and the exercise and fresh air certainly helped clear a few stubborn cobwebs. The recipe is originally from the Good Food Magazine although I have cut down on the amount of sugar in the topping. 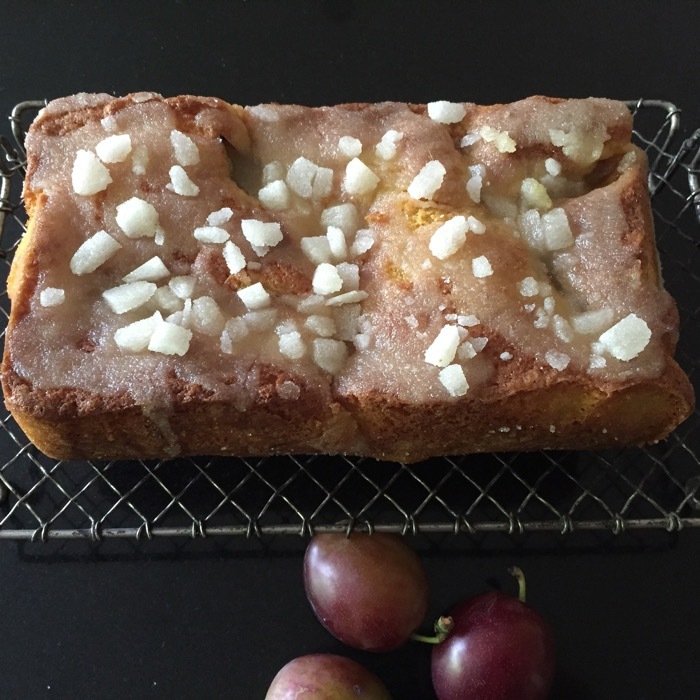 At first glance it would seem there are not enough plums (200g is only about six plums) but it turns out lovely and fruity and any more would probably make for a soggy cake so don’t be tempted to add any extra. Unfortunately I only took one photo of the cake on my iphone so I don’t have loads of photographs for you this time round but hopefully my mojo will be in full swing very shortly and I’ll be sharing lots more autumny recipes with you. In fact, I almost forgot I have three very nice pumpkins from the vegetable patch that are screaming to be made into soup, or maybe a pie…. You will need a 2 pint loaf tin. lined with baking paper. Stone the plums. Cut half into wedges, keep to one side, and roughy chop the rest. Gradually add the eggs and yolk. Add the flour, salt, orange zest and 2 Tbs of the juice. When smooth, fold in the chopped plums (not the wedges). Spoon the mixture into the prepared tin, smooth down and scatter the wedges over the top. Bake for about 50 mins until firm to the touch and a skewer comes out clean. (If the cake has not cooked after 45 mins, turn the over up to 170 for about 5-10 minutes). Remove from the oven, leave to cool for about ten minutes while you make the topping. Roughly crush the sugar cubes. Mix the lemon juice, caster sugar and remaining orange juice together. Lift the cake out of the tin using the baking paper and stand on the cooling rack. Spoon over the juice mixture then sprinkle with the crushed sugar. Leave to cool completely. My very deep condolences to you for your loss. The photos of your food creations are exquisite. They are glorious introductions to tempting recipes. I will be a frequent visitor and am anxiously waiting to try my hand at replicating any number of these mouth watering recipes.